Magnetic field at the position of protostars and T Tauri stars are measured for IRAS 16293-2422, L1551 IRS5, NGC1333 IRAS 4A, and HL Tau (Tamura et al. 1995). Although HL Tau is a T Tauri star, it has a gas disk. Thus this is a Class I source. The others are believed to be in protostellar phase (Class 0 sources). It is known that IRAS 16293-2422, L1551 IRS5, and HL Tau have disks with the radii of 1500-4000 AU from radio observations of molecular lines. Further, near infrared observations have shown that these objects have 300-1000 AU dust disks. Figure 1.22 shows the E-vector of polarized light. If this is the dust thermal radiation, the direction of magnetic fields is perpendicular to the polarization E-vector. Figure shows the magnetic fields run almost perpendicular to the elongation of the gas disk. 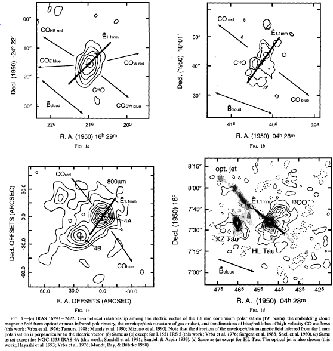 Global directions of magnetic field outside the gas disk and the direction of CO outflows are also shown in the figure by arrows. It is noteworthy that the directions of local magnetic fields, global magnetic fields, and outflows coincide with each other within deg. Figure 1.22: Polarization of the radio continuum mm, mm. IRAS 16293-2422 (upper-left), L1551 IRS5 (upper-right), NGC1333 IRAS 4A (lower-left), and HL Tau (lower-right). Taken from Tamura et al (1995).